So I’m going to get right down to this pattern without any fuss because to be completely honest, my little 3 month old and I have had a rough go lately in the sleeping and eating department (or lack thereof). If you’d like, leave this little apple without a face as pictured above. But how could you do that when the face makes this little cutie so darn cute? A word of advice – You will need safety eyes for this project! I found mine at Hobby Lobby in the doll clothes/googly eyes department. If you don’t have a Hobby Lobby near you (bless your heart, and I’m sorry) you can always stitch eyes on with yarn and a tapestry needle! I just prefer the safety eyes – they are easier to get looking perfectly symmetrical. Note: Work in continuous rounds, do not join at the end of each row. Simply place your stitch marker in the last stitch of each round and move it up as you move on to each new round. Finish off leaving a long tail. 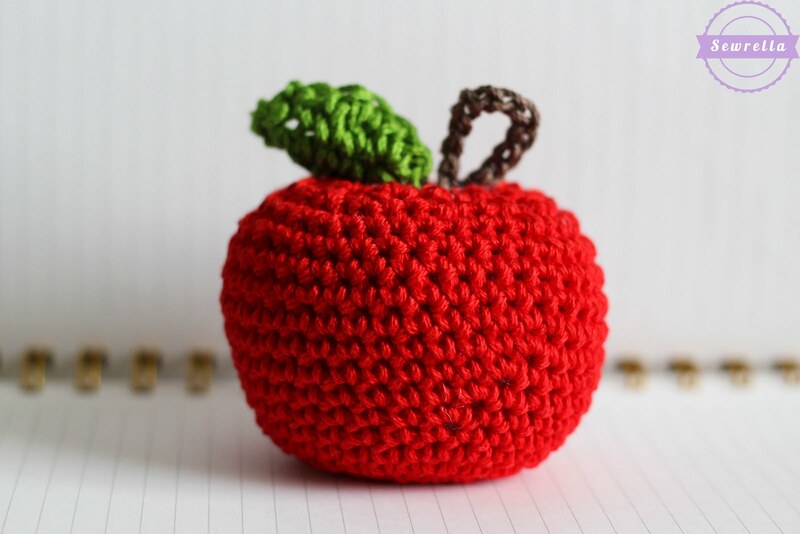 Thread your tail on the tapestry needle and sew down through the center “core” of the apple, coming out the other side, through your beginning ring of stitches (Round 1). 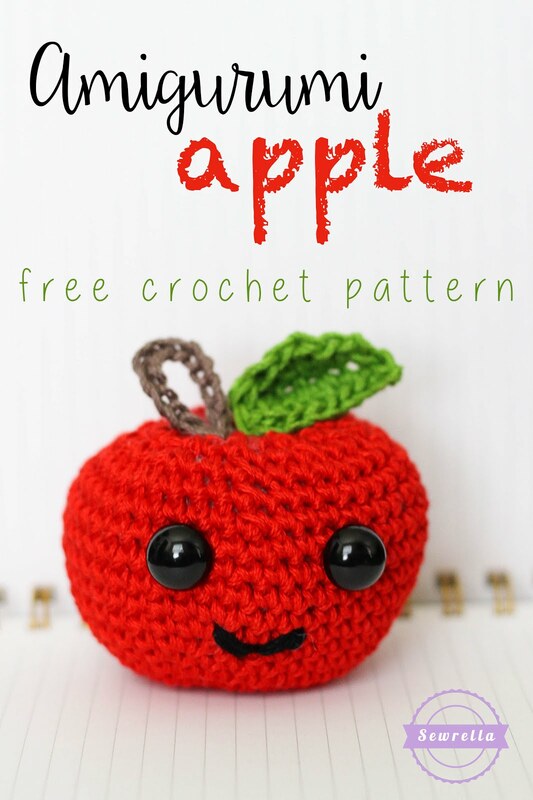 Pull this yarn tight, creating a dimple in the top of your apple. 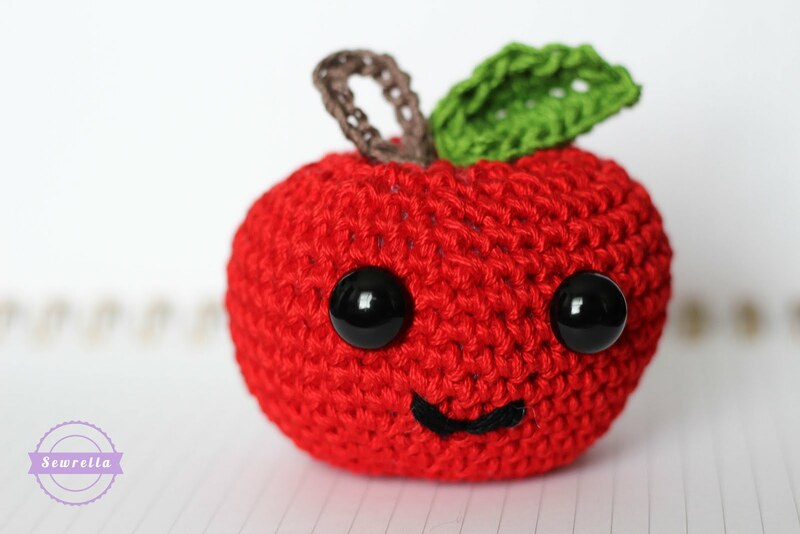 Holding in place, tie a tight knot with your beginning and ending yarn tails (now both on the outside bottom of your apple). Weave in these ends. Dc in next 2, Hdc in next, Sc in last, Ch 2, Sc in 2nd Ch from hook, sl st to join to first Sc of the leaf. Finish off leaving a long tail, sew onto the top dimple in the apple placing the rounded end at the center of the apple’s dimple. That’s it! Make this little cutie for your favorite teacher, or sneak this in your kids’ lunch pail as a fun surprise!